Welcome to Japanese Cooking Class Tokyo with Mari. Bento Box Sushi Roll Welcome to our home Teriyaki Chicken Tempura customized class only for you Sashimi Okonomiyaki Japanese Sweets - Dango Welcome to our home Special menu from Hokkaido. 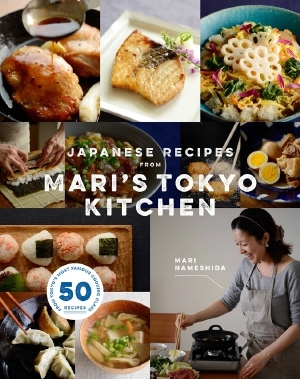 【New】Mari’s first cookbook “Japanese recipes from Mari’s Tokyo Kitchen” will be published on Aug, 2015! - While I cannot offer the cooking class, I am often asked by visitors in which class the visitors should enjoy cooking. I would recommend “Musubi Japanese Cooking Class Tokyo"
- We published Japanese cookbook in English. If your are interested in this, please visit here and check Japanese recipes from Mari’s Tokyo Kitchen..
- If you are allergic to animals (dogs/cats), please understand that we have a dog in my house. She's in her cage during the class, and is not allowed to come close to you. Hi, I'm Mari. Thank you for coming to our web site. I am happy to offer Japanese cooking class for you in Tokyo. I prepare the beautiful and delicious Japanese traditional homemade menus of dishes and sweets which vary seasonally for the guests of travelers and residents. Using seasonable ingredients helps not only to maintain bodily functions, but also to feel four seasons. Japanese food has developed in a unique way, and you can experience its originality by making them. I always take care of teaching guests so that they can cook them again in their home countries. So, I feel so happy and am more motivated to hear that guests cook and eat our Japanese home made dishes with their families or friends after returning home. We have offered more than 100 kinds of menus for guests, so If you want, I can customize the menu only for you. Please ask me whatever you want to cook and eat. I live in Tokyo city area as a newly-married couple. I provide the cooking class not at the cooking studio but at our home. I have the experience of studying and working in California USA, and have worked for the international school as a school nurse. Therefore, you can be instructed in fluent English. The place of our house is the middle of Tokyo central area. It takes only 15- 20 minutes from Shinjuku/Ginza/Shibuya/Asakusa stations, and 5-10 minutes from Ginza/Tokyo stations. In addition, our home is within 5 minutes walk from Tsukiji fish market which is loved by many foreigners thanks to its tuna auction and fresh foods from the sea. We are only one provider of cooking class of Japanese sweets in English in Tokyo. If you are interested in authentic Japanese sweets which are totally different from Western sweets, please take a sweets class or add it on Japanese dishes course. If you are interested in my lesson, please read the details of Japanese Cooking Class Tokyo with Mari by clicking here..
To see reviews of our guests, please access to Reviews of Cooking Class Tokyo on trip advisor. For more pictures, please access to our facebook page "Japanese cooking class with Mari". You can check my Japanese recipe and cookbook here.